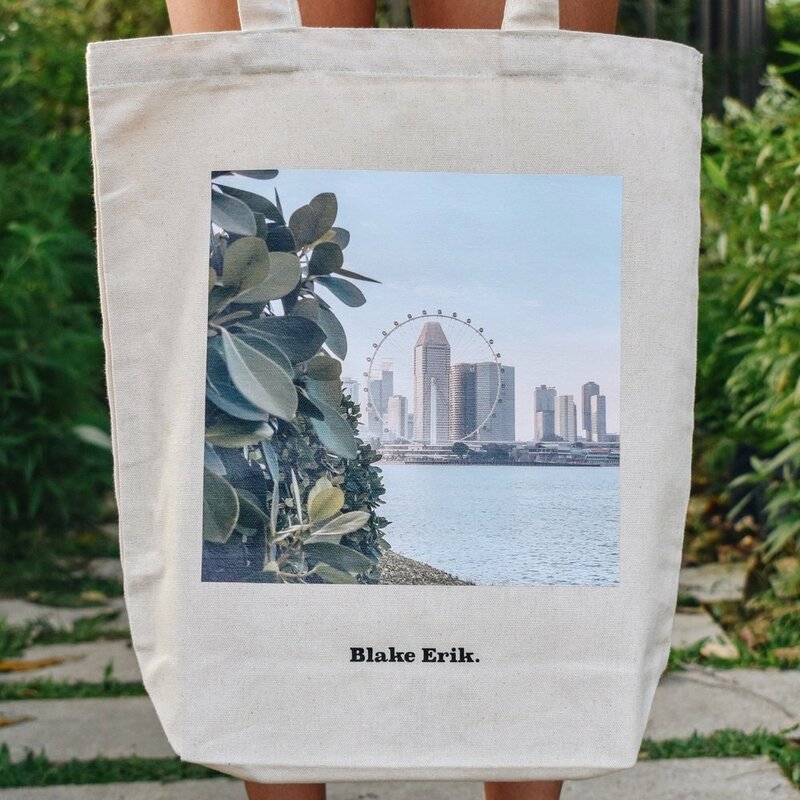 Postcards from the Road: Tote Bags Edition Series 003 Singapore — Blake Erik. I suppose this was always going to be in the cards— when doing booths over the past year, I’ve had plenty of people come up to me saying they would like a Singapore series of tote bags. After months, I’ve finally got three photographs that I like, and I’ve put them to print and here they are. This was a shot I didn’t plan. I was out for a regular dinner at Gardens by the Bay, somewhere earlier last month when Singapore was having a dry spell. As hot as it was, I loved that there were clear skies and proper sunsets, and the way the last rays of day hit the Gardens was stunning. I ventured out of the food court closer to the water’s edge, where a couple of kids were playing. On the left, the sun was setting over the city skyline, and I loved the gradient it painted the skies. I’m an absolute sucker for a lantern aesthetic, and there’s nowhere better than Chinatown for it. In the sun, the colours of Chinatown spring to life, and the lanterns that hang above the streets glisten in the sun. Sure, it might be busy, bustling and noisy on the streets itself, but look above and you’ll find the colourful lanterns just swaying in the gentle afternoon breeze. Back when I lived in Spain when I was 19, it was interesting to find out that when most people heard I was from Singapore, they would immediately think of the infinity pool looking over the city skyline at the top of the Marina Bay Sands hotel. And seeing as in comparison to a lot of icons around the world like The London Eye or the Eiffel Tower, Marina Bay Sands hasn’t been around for all that long, and for so many people around the world to recognise that as an icon of Singapore, I think that’s quite something. I took this photograph from the rooftop of the National Gallery, which though isn’t high, offers a clear, unobstructed view of said icon, as well as the accompanying ArtScience Museum to the left.